A new and novel way to endorse your merchandise is door hanger. Hotel rooms keep these to steer clear of redundant intrusion but now you can use these to linger 24/7 in your customers mind. These are a terrific source of product promotion. People mostly tend to avoid junk mails but these door hangers can�t be circumvented very easily. With our artistic designs and allusive artwork these hangers become special and eye-catchy. 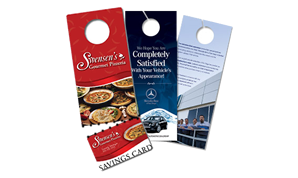 Door hangers are used as marketing tool for marketing campaigns of different shops, . 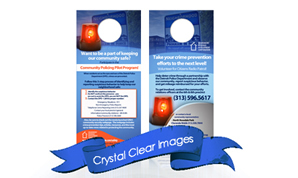 . .
We print your door hangers with UV coating, gloss coated cover to make them more vivacious and shield your door hanger. It depends on you which side you want to coat. You can design your own door hangers and upload on our site or give us a free hand to design. You can upload your file in format of TIF, TIFF, EPS, AI, PSD, JPG, PNG or PDF. Make sure your images and graphics are 350 dpi. Both CMYK and black and white Image printing service is available. Make sure you leave some space for bleed while designing your hanger. Perforation line should be marked carefully so that it may blemish your artwork. You can always upload your own artwork or can choose one down our archive, which our artists have exclusively premeditated for you. You can get them in foil stamping or die-cut in any shape and size.